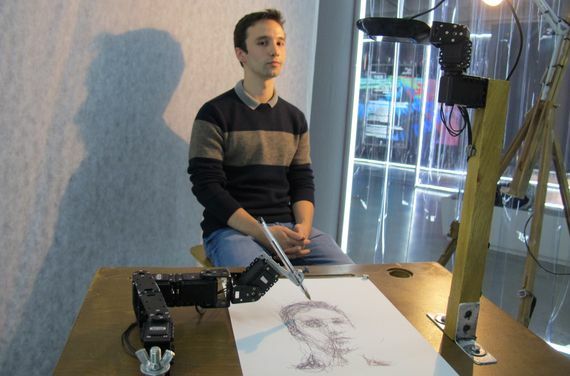 Two robotic arms that each hold a pen begin to draw with short strokes on two sheets of paper— two eyes, a mouth and the silhouette of a face. They portray the front and profile view of Eliseo Carrera Bustillo, a 26-year-old student sitting on a stool while two cameras observe and analyse him closely. 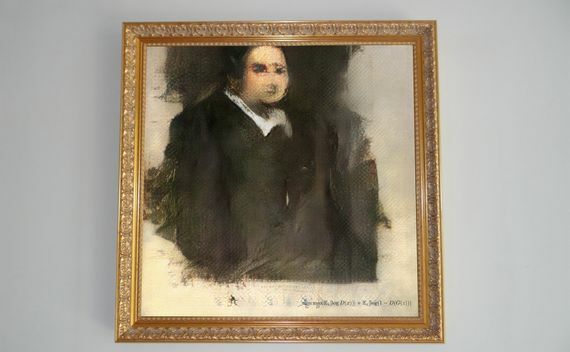 Both machines imitate the style of their creator—the French artist Patrick Tresset—and it only takes half an hour to finish the portrait and sign it. Nowadays, more and more artificial intelligence systems paint pictures, compose music, create poetry and write novels. But what difference is there between a work created by a machine and by a human? Will these systems replace artists? Will they be able to break down the barrier of creativity? Machines follow the instructions of the algorithm with which they have been programmed. “An artificial intelligence does not have the ability to understand the meaning of the symbols it handles, nor to interpret sentences, scores or drawings. It will never be possible for a machine to approach the artistic grandeur of Goya or Beethoven,” explains Claudia Giannetti, expert in the relationship between art, science and technology and curator of the Espacio Fundación Telefónica exhibition Beyond 2001: Odysseys of Intelligence, in which the creation of Tresset is exhibited. The field of music was one of the first to which artificial intelligence specialists paid attention in the 1950s. Giannetti points out that “the achievements have been extraordinary.” For example, the first musical with a computer-generated score and libretto was released in London in 2016, and there are already robots capable of directing a symphony orchestra, and bands composed entirely of robots. This is the case for Z-Machines, consisting of a robot keyboardist, a robot guitarist with 72 fingers and a robot drummer with 22 arms, created at the University of Tokyo and capable of playing any score, according to CNN. Artificial intelligence systems that make music have also been developed: DeepBach is programmed to compose chorales in the style of Johann Sebastian Bach and Flow Machines can compose songs in the style of the Beatles. “The algorithms that generate music will have a huge impact in the short term in the field of commercial music: music for audiovisual media, film and advertising,” explains Gustavo Díaz-Jerez, composer and principal musical advisor in the Melomics project at the Malaga University. This latest initiative consists of the development of IAMUS, a program that creates contemporary music and whose works have been performed and recorded on a disc by the London Symphony Orchestra, among other artists. In the same field one finds Jorge Calvo Zaragoza, a computer specialist in Valencia, who in 2018 was awarded the Young Computer Researchers Prize awarded by the BBVA Foundation and the Computer Science Society of Spain and whose research focuses on teaching computers to read musical scores. “One can make an analogy with chess: the way a chess player plays is totally different from how a machine plays. Therefore, the machine can provide new game strategies or approaches that a human might not consider, and thus improve their game based on it. It’s something that, in fact, professional chess players do,” explains Calvo. Music, according to the computer scientist, consists of purely mathematical elements that are easily modelled by a computer. Although an artificial intelligence system “can’t feel,” it can learn to model what characteristics make humans view some compositions as “sad” and others as “happy”, and can compose a song based on those characteristics. “Machines can become much more creative than a human because they can be devoid of any experience and therefore generate compositions without any influence, something difficult for a human to do who will always be influenced by their own experiences,” he says. 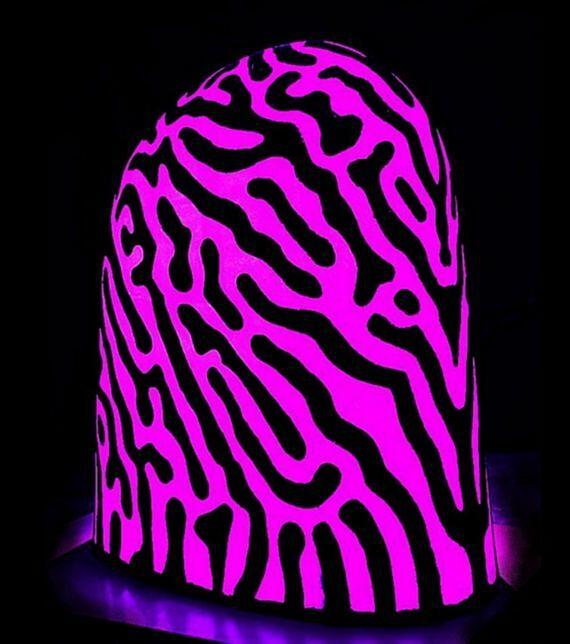 But among the experts there is no consensus on whether machines can actually be creative. Since the year 2000, Pablo Gervás, a computer engineer from the Complutense University of Madrid, has created various programs that generate poems after analysing thousands of journalistic texts, classic poems and novels such as Tarzan, The Jungle Book and Peter Pan. “The computers that generate outlines of simple literary works can identify combinations of form and content that are innovative. Whether that is creative or not is something more subjective, just like when you ask if the Hollywood director who makes a remake of a hit from the 1950s is creative, or if the writer who writes multiple novels with the same formula is creative,” explains Gervás. Drones That Kill on Their Own: Will Artificial Intelligence Reach the Battlefield?